If you want a project to keep kids occupied and busy, allow them to make a heart out of pony beads. Once the heart is complete, you can hook it onto a keychain, necklace, for a gift, embellishment, or to hang on a Christmas tree. 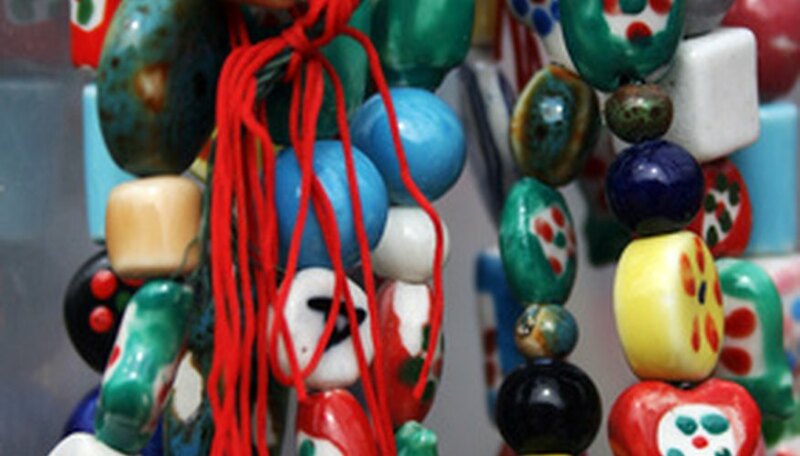 Pony beads come in a wide variety of colors, styles and shapes. Pony beads have a larger hole than seed beads. Some pony bead designs are held together with strips of leather, but because you have to go through the so many beads at once, it is better to use string, lacing cord, very thin ribbon or satin cord. Cut two yards of satin cord and fold it in half to mark the center. If you are going to use the heart for a keychain, necklace pendant or some other decoration, tie a lanyard hook or keychain ring to the center of the cord with a half hitch knot. To make this knot, push the folded end through the lanyard hook. Bring up the loose ends of the cord and insert them into the folded section of your cord. Pull on the strings to tighten the cord. String eight yellow pony beads onto the cord on the right hand side. You don’t have to use yellow beads; you can use any color that you want. When making this pattern, always pick up the pony beads using the cord on the right hand side. If you are left-handed, then always pick up the beads using the cord on the left hand side. Pick up the cord on the left hand side and push the end through the beads going in the opposite direction. Thread nine yellow pony beads on the cord on the right hand side. Insert the cord on the left hand side and push it through the nine yellow beads going in the opposite direction. Repeat the previous step, except string on two yellow beads, two red beads, two yellow beads, two red beads and two yellow beads. The red beads are the beginning of another heart within the yellow heart. Repeat again, using the color sequence two yellow beads, three red beads, one yellow bead, three red beads and two yellow beads. This is the longest row of your heart shape. The rest of the rows decrease in the number of beads used. Repeat, threading on beads in the sequence of two yellow beads, six red beads and two yellow beads. Repeat using two yellow beads, five red beads and two yellow beads. Repeat with two yellow beads, four red beads and two yellow beads. Repeat with two yellow beads, three red beads and two yellow beads. Repeat using two yellow beads, two red beads and two yellow beads. Repeat with the color of two yellow beads, one red bead and two yellow beads. This completes the red heart within the yellow heart. Repeat, only this time use only four yellow beads. Repeat using three yellow beads. Repeat with one yellow bead. Tie the cord off with a double knot to keep the beads in place.